Mechanical Engineering Program is under the Department of Mechanical Engineering, Faculty of Engineering, Hasanuddin University along with two other study programs, which are Master Program of Mechanical Engineering and Doctoral Program of Mechanical Engineering. ME Programs led by a head of department and assisted by a secretary. To carry out the functions and duties majors, Head and secretary of the department share duties and responsibilities which the Head of the department running the department for external relations functions as well as the academic field while the department secretary dealing with internal problems, financial administration and facilities. 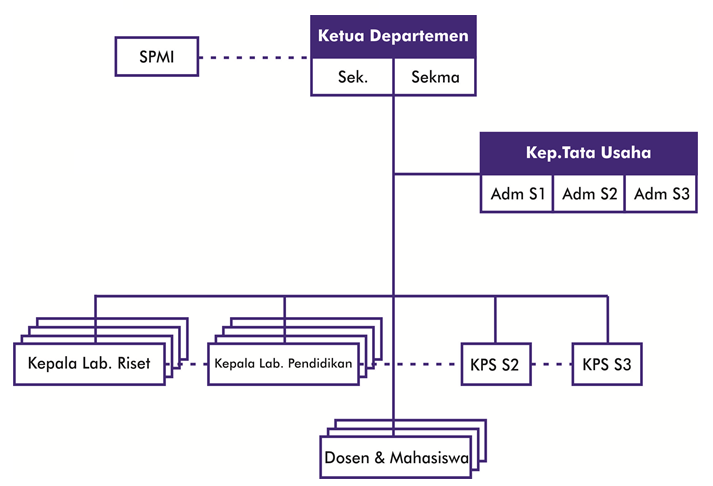 Although there are roles and responsibilities between the head and the secretary of the department, but the final decision will be taken remains through the coordination and approval of head of the department. The main task of the study program is to carry out academic activities, especially the lecture such as preparing lecture schedules, monitoring the implementation of the work plan lectures and courses including a budget plan every year. To run these functions, the head of the study program is assisted by a secretariat head of department and an administrative staff.